Chronically Me: Flushing Out My Life And Times With IBS, A Memoir in Comics – Amazon Select Free Book Giveaway August 17-21, 2015!!! 5-stars – A masterpiece both in its illustrations and content. 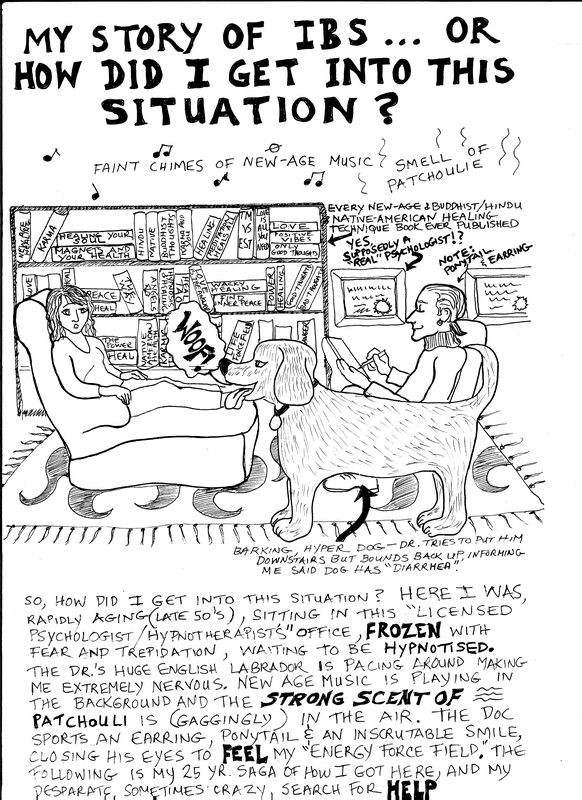 Joy Spencer’s comic illustrated book “Chronically Me: Flushing Out My Life and Times, a Memoir in Comics” provides a path through her own personal Irritable Bowel Syndrome maze. It captures precisely the trials and tribulations of someone who has IBS. I have a great affinity with someone who understands what it is like to be diagnosed with IBS, to travel from doctor to doctor trying to find a clear treatment, and can convey it all in such a creative fashion. Some might not click with the comic style; however, the content in the comic bubbles above and around the illustrations are truly what someone with IBS can relate to. Joy oozes empathy and someone with IBS, and their family, can really relate to the struggle that she faces. Needless to say, someone new to IBS can also relate to the path that Joy follows because they may want to try some of her avenues them self. Joy’s book gave me a great deal of comfort knowing that I’m not alone in my own struggle with IBS. For that, this personal masterpiece will be read over and over again when my IBS gets me down. We won't spam you... promise! We will send you an email when we post a new cartoon though. I am an artist who has had Irritable Bowel Syndrome (IBS) for over 25 years. 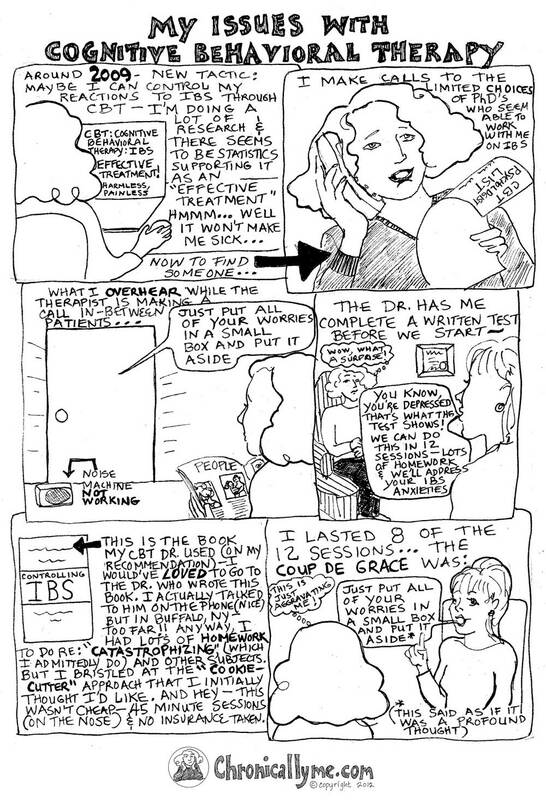 I finally decided to put my artistic ability and humor together with my experiences as an IBS sufferer to create a cartoon blog. This blog provides an outlet for me, and will hopefully resonate with others who have the same chronic illness. Five Days Only…FREE KINDLE BOOK GIVEAWAY from September 25th to September 29th, 2017! NEW KINDLE FREE PROMOTIONAL GIVEAWAY: 5 DAYS, SEPTEMBER 25th-29th, 2017!!! FREE AMAZON KINDLE BOOK GIVEAWAY MARCH 29th to APRIL 2nd!! Chronically Me: Flushing Out My Life And Times With IBS, A Memoir in Comics – FREE KINDLE BOOK AUGUST 17th TO AUGUST 21ST!!! Boethian on Five Days Only…FREE KINDLE BOOK GIVEAWAY from September 25th to September 29th, 2017! me on A New Pill is Out!!! Martha on A New Pill is Out!! !